Hawaii’s Thousand Friends will be 30 on January 7, 2011. Hawaii’s Thousand Friends is based on the 1000 Friends of Oregon. Oregon Governor Tom McCall (1967-75) and Henry Richmond founded 1000 Friends of Oregon in 1975. Their goal was to protect Oregon’s quality of life from the effects of uncontrolled growth. JoAnn Yukimura and Marilyn Bornhorst attended a land use conference in Washington State (c1979) and brought back the concept to Hawai`i. Thousand Friends currently exist in several places including Hawai`i, Kaua`i, Iowa, Maryland, Wisconsin, Oregon, Connecticut and Minnesota. JoAnn Yukimura was a founder of the 1000 Friends of Kaua`i. She has a B.A. in psychology (Stanford University) and was Kaua`i Chair for the 1970 U.S. Senate campaign of Tony Hodges -- that experience motivated her to go to law school. She graduated from the University of Washington Law School. Yukimura served on the Kaua‘i County Council (1976-80; 1984-88) and was Kaua`i Mayor (1988-94) becoming the first woman of Japanese-American ancestry to be elected mayor in the United States. 1000 Friends of Kaua`i dates from at least January-February 1980. In 1979 Grove Farm Company applied for a Boundary Amendment with the Land Use Commission (Docket A79-467). 1000 Friends of Kaua`i filed a Motion to Intervene and then withdrew during the January-February 1980 timeframe. Their attorney was Stephen A Levine. Clarence Ku Ching was a founding member of the organization, remaining until elected as an OHA Trustee in 1986. He told me that other people heavily involved in the beginning were Mike Wilson, Cynthia Thielen, Cobey Black, Susan Heftel, Howard Criss, Connie Sofio, Ricke Weiss, Duane Preble, William Dendle, Helen Cole, Agnes Conrad, Guy Nakamoto, Astrid Monson, Kem Lowry, Gard Kealoha, Karen Holt, Lyle Webster and Betty Gordon. Cynthia Thielen convinced the owner of a hotel on Fort Street Mall to give HTF a rent free office. This first office for HTF became headquarters for Executive Director Barbara Beck. The organization has had 5 Executive Directors: Barbara Beck (1982), Kathryn Momi Albu (1983-84), Muriel Seto (1984-88), Steve Holmes (1988-89) and Donna Wong (1990-). Muriel Seto fought tirelessly to protect Hawai`i from overdevelopment. Starting in the 1960s, she championed the protection of Kawai Nui Marsh. She co-founded the Kawai’nui Heritage Foundation, co-founded Waihona 'Aina (1995) and was a long-time member of the Lani-Kailua Outdoor Circle. HTF focused on Kawai Nui Marsh in 1982, taking it on as one of their core values. Ulupo Heiau built c.900 A.D. located adjacent to Kawai Nui Marsh, may be O`ahu’s largest heiau. A 450-acre fishpond was located next to it. 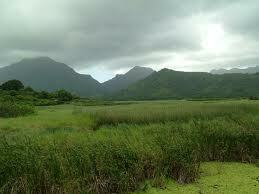 In 1972 large landowners sought to build a shopping center to rival Ala Moana in Kawai Nui Marsh. This action would have destroyed the wetlands. Over a period of three decades, activists sought to protect the marsh. In 2005 Kawai Nui/Hamakua Marshland Complex became the 22nd U.S. Wetland of International Importance The United States is one of 144 signers of the Ramsar Convention (1971), the only international agreement solely dedicated to worldwide protection of wetland ecosystems. Muriel Seto received several award including from an Alu Like Award (1986) and the National Environmental Woman of Action Award (1993), was appointed by Governor Cayetano to the State Environmental Quality Control Commission (1994), was named Hawaii’s Thousand Friends Unsung Hero of 2005, and received a Certificate of Recognition from the Kailua Neighborhood Board (2006). Mike Wilson, a co-founder and former HTF President, was named State Director of the Department of Land and Natural Resources (1992) by Governor Cayetano. Donna Wong has come to symbolize Hawaii’s Thousand Friends. Active in the PTA and the Olomana Community Association, she ran for and was elected to the Kailua Neighborhood Board in 1980. In the mid 1980s she co-founded Hands Around O‘ahu to work on protecting agricultural land from golf courses. She became the Executive Director of HTF in 1990. The State House of Representatives recognized Donna Wong and HTF "protecting and advocating for responsible land use, planning and management of Hawai'i's 'aina" (1998). Donna Wong received the 2009 Women's History Month Award from the Hawaii State Commission on the Status of Women. I attended the reception held in her honor at Washington Place. Commission Chairwoman Carol Philips stated: "Donna Wong has been and remains one of the most knowledgeable and staunchest defenders of Hawai'i's fragile environment in modern history." HTF worked on land use issues throughout the State including Camp Kailua (HTF attorneys Cynthia Thielen and Tom Grande), Nukoli'i, Kawela Bay, Oceanside 1250, Pua'ena Eco-Camp, Waimea Valley and Irwin Memorial Park - Aloha Tower Development Corporation. Many who served on the HTF Board of Directors also served at various times on other Boards, for example, Clarence Ching, Dennis Callan, Guy Nakamoto, Fred Madlener and retired Hawai`i Supreme Court Justice H. Baird Kidwell also served on Life of the Land’s Board of Directors. In 1993 O`ahu Sugar announced it would cease operations in 1995 setting off an intense fight over water. The Hawai`i Supreme Court noted that the monumental case (Waiahole Water) was of "unprecedented size, duration, and complexity." HTF stressed that water is protected as a public trust resource. HTF attorney Jim Paul convinced the Water Commission and the Hawaii Supreme Court that stream water and the flora and fauna it sustains are public trust resources that the state has a trust responsibility to protect. HTF has co-sponsored at least eight Peoples Water Conferences. HTF opposed Puna geothermal development because of the “impact on cultural integrity of the area and impacts on human health and the environment” (1985). HTF supported including Cultural Impact Statements as part of Environmental Impact Statement process which was finally accomplished in 2000.